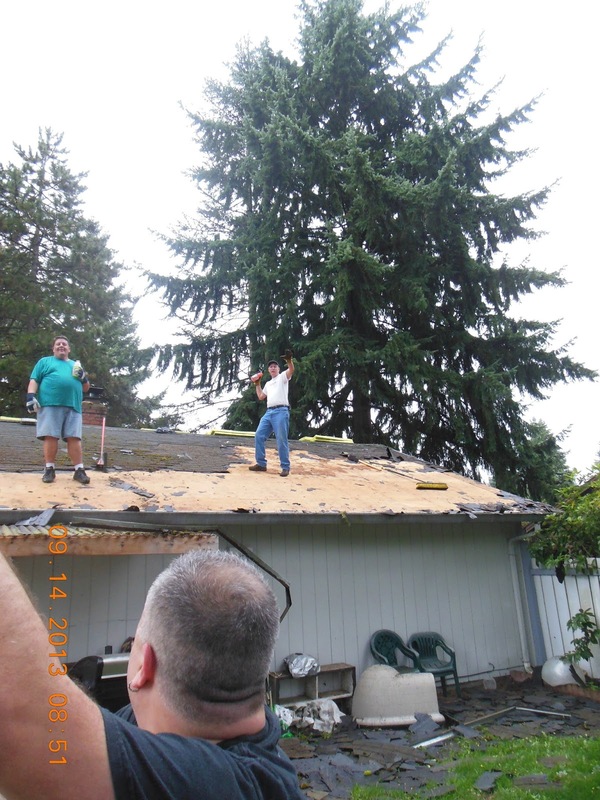 As I mentioned yesterday, we were roofing and making jam. 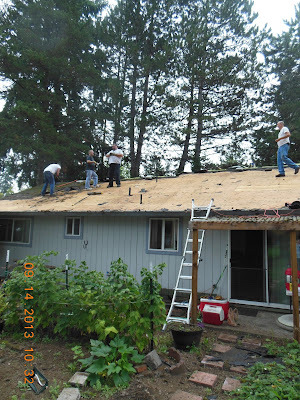 We also knew that the chance of rain was increasing, but what is a crew to do? And as would be, we found a few surprises along the way. 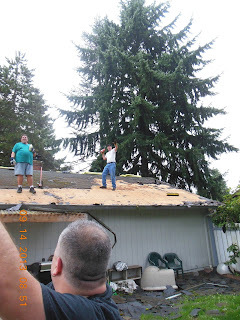 Like two (yep 2) layers of old roofing to tear off.......That slowed things down a bit, and coupled with the looming threat of rain, that means today, they are roofing in the drizzle and rain. A light rain for the most part is not a problem, but bless them for working so hard under these conditions. My men folk are the best! 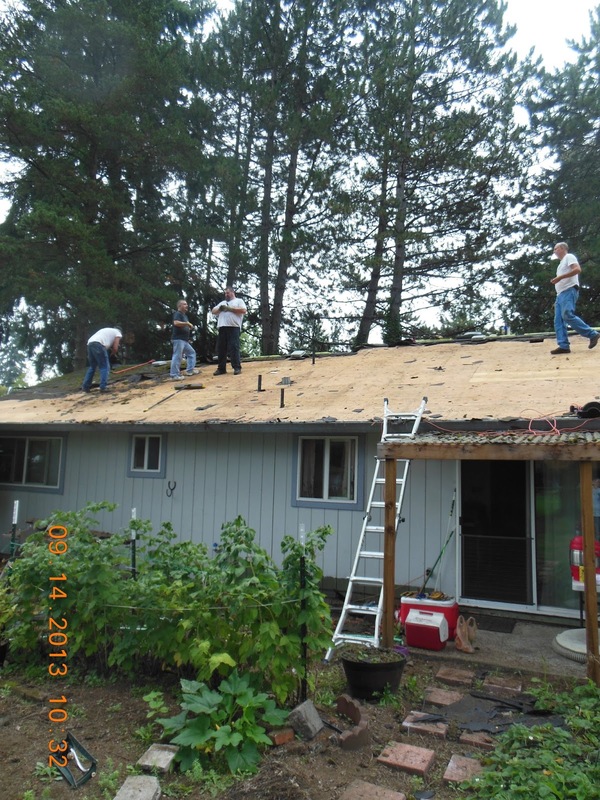 Most of the "tear-off" is done. 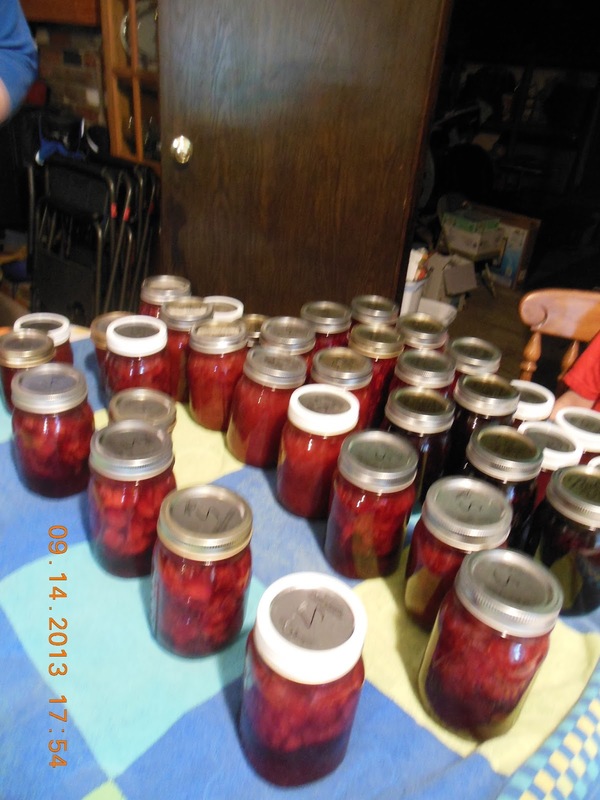 Inside the house, we were making food for the crew and making jam for this winter. When my daughter and I get together, we make jam all day and split the goodies. We made Raspberry Rhubarb, Strawberry (2 batches) Strawberry Rhubarb, Mixed berry (all the leftovers are made into a "specialty" jam of the season! ), Rhubarb Grapefruit and Blackberry. Generally we use 8 cups of fruit and 6 cups of sugar for a batch. You get less jam per batch, but it sure is delicious! 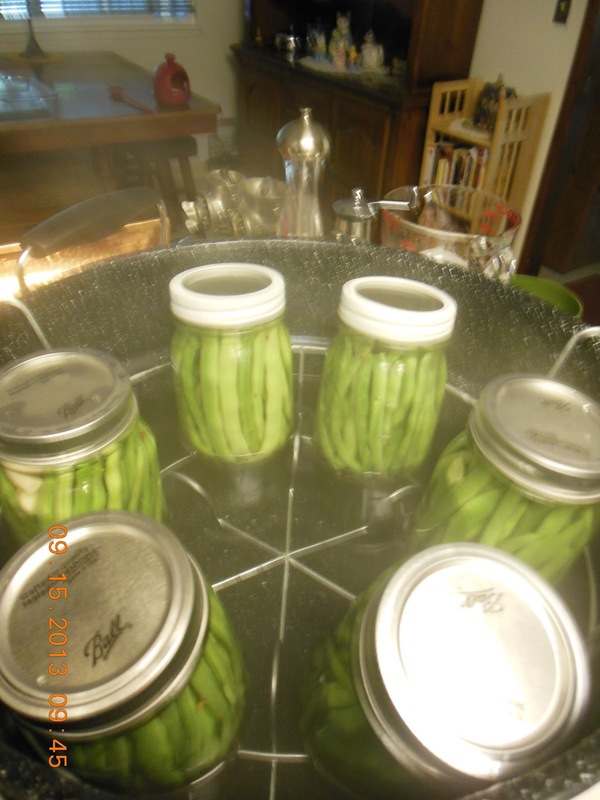 It has been fun to not only work with my daughter and teach her jam making, but my own return to canning has been personally rewarding. I had been away from canning for so many years and now get to enjoy the look of my canning cupboard as I put more home canned items there. 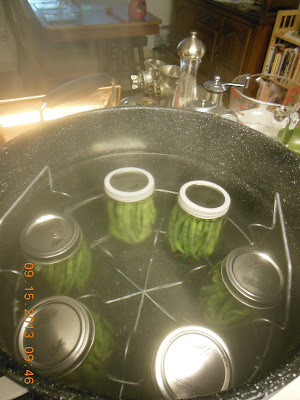 Today I am turning some of those wonderful green beans my husband grows into Pickled Green Beans. Fill water bath canner with water and bring to a boil, while preparing jars and pickling liquid. Place fresh dill (or seed) whole cloves of garlic and 1/2 t crushed red pepper in bottom of each jar. 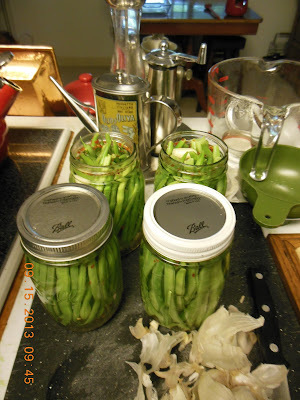 Fill jars with beans, and set aside. Yes that is garlic and seasonings on top, I wanted to fill the jars with beans to know how much pickling brine to make. Something tells me, the beans won't mind the seasonings being on top. In a large pan, bring vinegar, water and salt to a boil. Ladle over prepared green beans to within 1/2 inch from top of the jar. Wipe top of jars with a damp cloth to make sure they are spotless, this will insure a perfect seal. Cap with a dome lid and ring. I love old canning kettles, and the fact that even today when you buy one new, they look the same from your childhood. I stood by my own Mom's elbow while jam making was done. Process in boiling water bath 10 minutes. Let cool, remove rings. Store in cool, dry storage area. 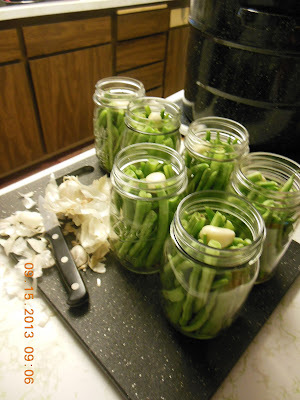 1 comment kitchen basics, preserving, Recipe rating Oh Yes!, Stock your Pantry! 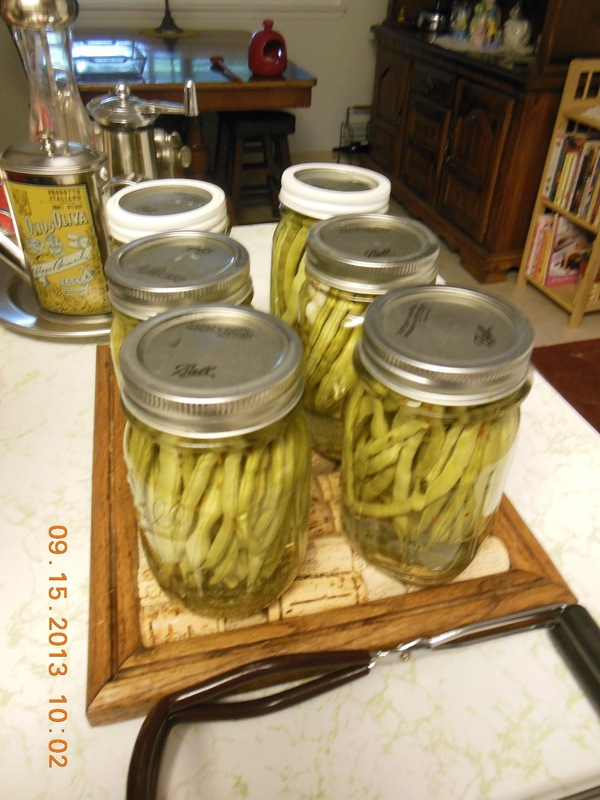 Yum, I love pickled green beans!